Hi, I’m interested in Lenovo IdeaPad 100 - 15.6" - Core i5 Notebook - 8GB RAM - 1TB HHD - Bluetech Computers . Please contact me. Thanks! Demo Laptop, Great performance, great price. The Lenovo ideapad 100 gives you everything that you need, and nothing you don't. 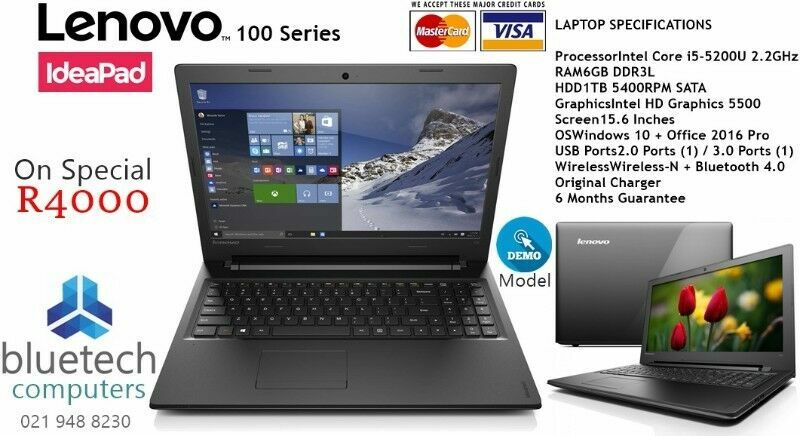 This Lenovo laptop is easy to transport, affordable, and has the power to complete any task. Equipped with a Intel Core i5-5200U processor, which helps you conquer demanding tasks. This laptop has an intuitive Windows 10 operating system with HDMI graphic ports to help you improve productivity. Intel HD 5500 graphics, USB 2.0 and 3.0 ports and Bluetooth 4.0 make this laptop perfect for enjoying and uploading media..